Semi-final spots remain open to three teams in Group B after New Zealand scraped through with a narrow 2-1 win over Solomon Islands before Samoa had their hopes crushed by a 3-0 loss to Fiji at Stade Pater tonight. The opening match had the crowd on the edge of their seats as New Zealand and Solomon Islands battled neck-and-neck for 90 minutes, with the Kiwis fortunate to hold off the Solomons attack before eventually regaining their lead in the 84th minute. Just three minutes in an unmarked Jake Williams met a long throw-in at the back post firing in the only goal of the half. Scoring so early could have had fans thinking Solomon Islands were in for similar treatment to Samoa two days earlier, however the young side held their own against the more highly favoured defending champions. Junior Kaoni became the side’s hero when he fired a mis-timed clearance past Zac Jones in the 47th minute. New Zealand lifted following the goal, but Solomon Islands kept pace, applying heavy pressure to their opponent’s back line. Don Keana, Alfred Elvis, Steward Toata and Elis Mana all lined up several shots but the New Zealand backline proved too hard to break down. Solomon Islands goalkeeper Joel Nanago kept his side’s hopes of at least managing a draw when he cleaned up his own mistake making a one-handed diving save after sending his clearance to a New Zealand foot outside the box. Only five minutes later, the keeper was called on again when Max Mata received a perfect pass on the penalty spot from Liberato Cacace. Mata hit the ball at the bottom right corner first time but Nanago, in full stretch, just got a foot to it. Mata came into the fray again when he set up substitute Charles Spragg who fired in the winner while also claiming his place at the top of the goal scorers’ leader board. The crowd had high hopes of another equaliser from the Melanesians as they dominated the remainder of the match but the Kiwis held them off. After the nail-biting encounter, New Zealand coach Danny Hay was relieved with the win, and hopes his side have learnt their lesson about complacency, especially against an agile and “technically gifted” nation like Solomon Islands. “I’ve played against Solomon Islands sides a lot so trying to tell our players how technically gifted the Solomon Islands’ players are and how you can’t dive in the box and you’ve got to stay on your feet, I think we dodged a bullet really, getting away with that, because they showed a lot of skill and a lot of composure on the ball,” he said. “That’s a big wake up call for us as to the quality of the opposition teams we’re going to play against and the quality of individual players we’re going to play against. Solomon Islands coach Marlon Houkarawa was so vocal throughout the 90 minutes that he struggled to speak as he recalled the game. “I was very happy with the boys’ performance against New Zealand. I’ve lost my voice because I was shouting, screaming and giving instructions but I believe they gave them a good game today,” he said. Sticking to their game-plan and playing to Solomon Islands’ advantages paid off for the side as they dominated with the ball on the ground, and Houkarawa believes the match could have easily gone either way with the performance his team put on. “I think New Zealand have a strength with their tall players and they take advantage of that and play long balls and make use of the corner kicks but for my team, because we’re short, we played with the ball on the ground and we actually created a lot of chances,” he said. In a physical clash that completely contrasted the day’s earlier match, Fiji battled hard to defeat Samoa 3-0 in front of a boisterous crowd. The Fijians dominated the first half but only managed to convert two of their attempts thanks in part to the fast gloves of Samoa’s Pele Fatu and some missed opportunities from the Fiji attack. Captain Semi Matalau was the first to get his name on the sheet with his goal in the 9th minute, and Ratu Dau managed one in both halves to secure the 3-0 win for Fiji. The physicality escalated throughout the match as players from both sides tried to use their size and strength to their advantage, leading to an early exit in the first half for Samoan Falaniko Nanumea, who was replaced by Lotial Mano after sustaining an injury. Disputes erupted on the field in the second half as both teams’ frustrations grew. The tention peaked in additional time, leading to Harlen Russell receiving his marching orders after wiping out Ratu Dau as he pushed for the hat-trick, leaving the Fijian requiring the stretcher. Despite getting the three points to keep themselves in the running for the semi-finals, Fiji coach Shalen Lal knows his side will need to improve on their striking accuracy if they want to see another win in the competition. “We came in to score a lot of goals but things didn’t go our way. The match was very physical and I lost a lot of players through injuries and we had good chances but missed a lot of opportunities. Although he’s well aware that there’s room for improvement before their final match of Group B against New Zealand on Saturday, Lal is pleased his side for achieving what they set out to do. With semi-final hopes over before their final group match against Solomon Islands, Samoa coach Desmond Faaiuaso was disappointed with the defeat but proud to see his side improve their areas of weakness. “After our big defeat against New Zealand, we worked hard on our defensive side and they proved they can defend well,” he said. 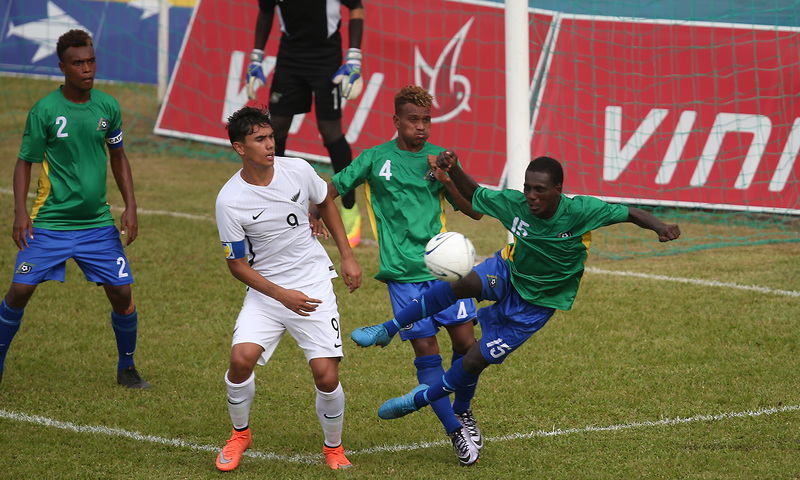 The two Group B representatives in the OFC U-17 Championship semi-finals will be determined when Solomon Islands take on Samoa before New Zealand take on Fiji in the last day of Group B action at Stade Pater in Papeete on 18 February.